A turning point in American political history occurred in 1828, which witnessed the election of Andrew Jackson over the incumbent John Quincy Adams. While democratic practices had been in ascendance since 1800, the year also saw the further unfolding of a democratic spirit in the United States. Supporters of Jackson called themselves Democrats or the Democracy, giving birth to the Democratic Party. Political authority appeared to rest with the majority as never before. During the 1800s, democratic reforms made steady progress with the abolition of property qualifications for voting and the birth of new forms of political party organization. The 1828 campaign pushed new democratic practices even further and highlighted the difference between the Jacksonian expanded electorate and the older, exclusive Adams style. A slogan of the day, “Adams who can write/Jackson who can fight,” captured the contrast between Adams the aristocrat and Jackson the frontiersman. The 1828 campaign differed significantly from earlier presidential contests because of the party organization that promoted Andrew Jackson. Jackson and his supporters reminded voters of the “corrupt bargain” of 1824. They framed it as the work of a small group of political elites deciding who would lead the nation, acting in a self-serving manner and ignoring the will of the majority ([link]). From Nashville, Tennessee, the Jackson campaign organized supporters around the nation through editorials in partisan newspapers and other publications. Pro-Jackson newspapers heralded the “hero of New Orleans” while denouncing Adams. Though he did not wage an election campaign filled with public appearances, Jackson did give one major campaign speech in New Orleans on January 8, the anniversary of the defeat of the British in 1815. He also engaged in rounds of discussion with politicians who came to his home, the Hermitage, in Nashville. 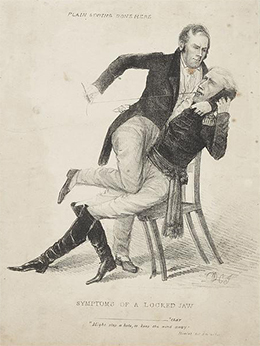 The bitter rivalry between Andrew Jackson and Henry Clay was exacerbated by the “corrupt bargain” of 1824, which Jackson made much of during his successful presidential campaign in 1828. This drawing, published in the 1830s during the debates over the future of the Second Bank of the United States, shows Clay sewing up Jackson’s mouth while the “cure for calumny [slander]” protrudes from his pocket. At the local level, Jackson’s supporters worked to bring in as many new voters as possible. Rallies, parades, and other rituals further broadcast the message that Jackson stood for the common man against the corrupt elite backing Adams and Clay. Democratic organizations called Hickory Clubs, a tribute to Jackson’s nickname, Old Hickory, also worked tirelessly to ensure his election. In November 1828, Jackson won an overwhelming victory over Adams, capturing 56 percent of the popular vote and 68 percent of the electoral vote. As in 1800, when Jefferson had won over the Federalist incumbent John Adams, the presidency passed to a new political party, the Democrats. The election was the climax of several decades of expanding democracy in the United States and the end of the older politics of deference. Visit The Hermitage to explore a timeline of Andrew Jackson’s life and career. How do you think the events of his younger life affected the trajectory of his political career? Amid revelations of widespread fraud, including the disclosure that some 1 million. Such examples seemed proof positive that the Democrats were disregarding merit, education, and respectability in decisions about the governing of the nation. In addition to dealing with rancor over rotation in office, the Jackson administration became embroiled in a personal scandal known as the Petticoat affair. This incident exacerbated the division between the president’s team and the insider class in the nation’s capital, who found the new arrivals from Tennessee lacking in decorum and propriety. At the center of the storm was Margaret (“Peggy”) O’Neal, a well-known socialite in Washington, DC ([link]). O’Neal cut a striking figure and had connections to the republic’s most powerful men. She married John Timberlake, a naval officer, and they had three children. Rumors abounded, however, about her involvement with John Eaton, a U.S. senator from Tennessee who had come to Washington in 1818. 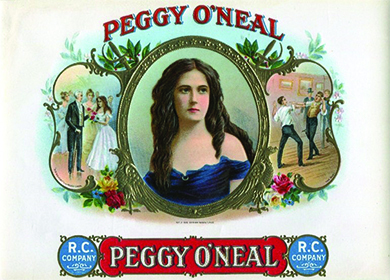 Peggy O’Neal was so well known that advertisers used her image to sell products to the public. In this anonymous nineteenth-century cigar-box lid, her portrait is flanked by vignettes showing her scandalous past. On the left, President Andrew Jackson presents her with flowers. On the right, two men fight a duel for her. Timberlake committed suicide in 1828, setting off a flurry of rumors that he had been distraught over his wife’s reputed infidelities. Eaton and Mrs. Timberlake married soon after, with the full approval of President Jackson. The so-called Petticoat affair divided Washington society. Many Washington socialites snubbed the new Mrs. Eaton as a woman of low moral character. Among those who would have nothing to do with her was Vice President John C. Calhoun’s wife, Floride. Calhoun fell out of favor with President Jackson, who defended Peggy Eaton and derided those who would not socialize with her, declaring she was “as chaste as a virgin.” (Jackson had personal reasons for defending Eaton: he drew a parallel between Eaton’s treatment and that of his late wife, Rachel, who had been subjected to attacks on her reputation related to her first marriage, which had ended in divorce.) Martin Van Buren, who defended the Eatons and organized social gatherings with them, became close to Jackson, who came to rely on a group of informal advisers that included Van Buren and was dubbed the Kitchen Cabinet. This select group of presidential supporters highlights the importance of party loyalty to Jackson and the Democratic Party. The Democratic-Republicans’ “corrupt bargain” that brought John Quincy Adams and Henry Clay to office in 1824 also helped to push them out of office in 1828. Jackson used it to highlight the cronyism of Washington politics. Supporters presented him as a true man of the people fighting against the elitism of Clay and Adams. Jackson rode a wave of populist fervor all the way to the White House, ushering in the ascendency of a new political party: the Democrats. Although Jackson ran on a platform of clearing the corruption out of Washington, he rewarded his own loyal followers with plum government jobs, thus continuing and intensifying the cycle of favoritism and corruption. What was the actual result of Jackson’s policy of “rotation in office”? The election of 1828 brought in the first presidency of which political party? What were the planks of Andrew Jackson’s campaign platform in 1828? Jackson campaigned as a man of the people, intent on sweeping away the corrupt elite by undoing the “corrupt bargain” of Adams’s election, making new federal appointments, and elevating officials whose election actually reflected the will of the majority of voters. What was the significance of the Petticoat affair? The Petticoat affair divided those loyal to President Jackson from Washington, DC, insiders. When Washington socialite Peggy O’Neal’s husband committed suicide and O’Neal then married John Eaton, a Tennessee senator with whom she was reportedly unfaithful to her husband, Jackson and those loyal to him defended Peggy Eaton against other Washington, DC, socialites and politicians. Martin Van Buren, in particular, supported the Eatons and became an important figure in Jackson’s “Kitchen Cabinet” of select supporters and advisers. The Rise of American Democracy by OpenStaxCollege is licensed under a Creative Commons Attribution 4.0 International License, except where otherwise noted.